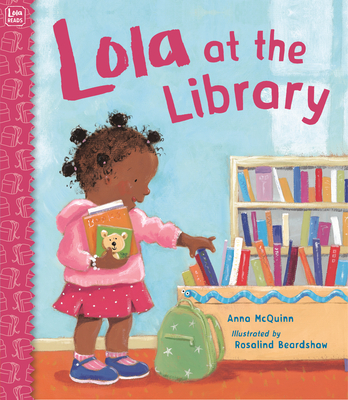 Learn about the library, checking out books, and story time with Lola. Every Tuesday Lola and her mommy go to the library. Lola meets her friends there. They share books and don't have to be quiet all the time. The nice librarian tells stories. There is a big machine that buzzes Lola's books in and out, and she can take any books she wants home with her. Lola and her mommy always stop for a treat on the way home. No wonder Lola loves the library. This gentle story of growing with books encourages little ones to discover the joy of reading as well as getting them ready and excited to visit the library. Sweet, bright illustrations are from a kids-eye point of view. Perfect for a lap read or story time, the first in Lola series, LOLA AT THE LIBRARY is a book young readers will fall in love with. Anna McQuinn is the author of more than twenty books for children, including WANDA'S WASHING MACHINE (Tiger Tales). She also works part-time as a librarian, running family book groups. Anna lives in Slough, England.